The construction of a 20 kilowatt hydro-power station at Hosororo, North West District (NWD) is scheduled to begin next month and, when completed, will produce electricity at 21 United States cents per kilowatt hour (kWh), 29 cents less than diesel-generated power, the Guyana Energy Agency (GEA) said Saturday. Construction is expected to finish by April, 2019. 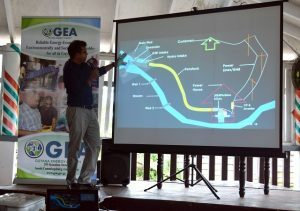 Chief Executive Officer of the GEA, Dr. Mahender Sharma said the Hosororo Hydropower station was the most economically feasible when compared to solar and diesel. “While it would cost US$0.50 to produce a kilowatt-hour from diesel and US$0.36 to produce a kilowatt-hour from solar, hydropower would cost US$0.31 to produce a kilowatt-hour of energy,” he was quoted as saying by the GEA. He further stated that “thanks to grant financing for the Project, this cost would reduce to US$0.21/kWh”. Though the Hosororo hydropower plant will only contribute eight percent of Mabaruma’s energy demand (approximately 64 MWh a year), Dr. Sharma noted that the supply “would help the township diversify its energy mix, provide energy security, and reduce the use of fossil fuel”. He said the project would have a very low environmental impact since structures, such as a powerhouse, were already in place from the project’s first attempt in the 80’s. In 2015, the German Government, through its German Agency for International Cooperation (GIZ) initiative, committed to assisting the GEA with developing the project. The US$165,175 project received US$91,108 in financing from the Government of Guyana and US$74,067 in financing from GIZ/REETA. According to Dr. Sharma, a lot of work was done over the past three years to reach the current level of the project’s realization. A Section of the audience at the public consultation for the construction of a hydro-power station at Hosororo, North West District. 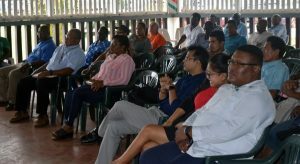 Speaking to the beneficiaries of the project, Dr. Sharma said that these were the Guyana Water Inc. (GWI), National Agricultural Research and Extension institute (NAREI); the Mabaruma Power Company; and the residents. There are currently approximately 700 customers, both residential and commercial, who are connected to the grid. The resuscitated hydropower project will feature a new design that was conceptualized by GEA’s Engineers and will entail the construction of a 20kW run-of-the- river type micro hydropower plant inclusive of weir/intake and penstocks but will use the existing powerhouse after it has undergone repairs. The Hosororo Hydropower Project was one of 67 sites identified in 1976 as having hydropower potential. Situated at the Hosororo Creek about 4.6 km bees flight to the south-west of Mabaruma the initial plant was built in the late 1980s to supply electricity to an agricultural produce processing facility that was built nearby. The project was abandoned some years after its inauguration. Supervision of the project during the construction phase will be conducted by GEA’s Engineers, along with their counterparts from the Hinterland Electrification Company Inc. (HECI) and the Mabaruma Power and Light Company (MPLC). Additionally, regular updates will be provided to the Mayor and councillors of the Region, and the general community, on the project through meetings and site visits. During these sessions they will be encouraged to participate in the monitoring of the project. The GEA said the project site has been of interest for several years and is expected to boost its human resource capacity, as it allows the Hydro Power Support Engineers of the Agency to gain knowledge and experience of hydro power development. “The Guyana Energy Agency will use the knowledge and experience gained from this project to continue its efforts towards the development of Hydropower in Guyana in keeping with its vision to provide reliable energy in an economically, environmentally and socially sustainable framework,” the agency said. The team from GEA visited Region One (Barima-Waini), from June 18 to 20, 2018 and included Chief Executive Officer, Dr. Mahender Sharma; Hydropower Support Engineers Messrs. Dolwin Khan and Winston Setal along with Technician, Mr. Christopher Nelson. As the Hosororo Hydropower Project nears commencement of installation, the GEA recently held a public consultation with residents of Mabaruma and other stakeholders as a part of the process to ensure that they were aware of what the project entails and its benefit to the community. During the question and answer segment of the consultation, the residents put forward a number of queries, including questions related to job opportunities, access to the site for recreational purposes, and the sustainability of the project. In response, Dr. Sharma explained that a number of jobs would be available for residents during and after construction, including surveyors, drivers, masons, supervisors, electricians, and accountants. He further said that residents would still be able to enjoy using the area as a recreational spot, while every effort would be made to ensure that the project does not become defunct once more.